Grain and shipping industry representatives say repairs on the Columbia and Snake river system haven't yet caused major complications. Kristin Meira, government relations director of the Pacific Northwest Waterways Association, said the system's four-month repair project is on schedule for locks to reopen at Lower Monumental Dam on March 13 and at John Day Dam March 18. The U.S. Army Corps of Engineers announced in January a five-day extension of work at The Dalles due to early gate fabrication issues. The locks are now slated to open on March 23. Meira said she has not heard from stakeholders about concerns with the closure. She said companies had 18 months to prepare for the closure. "We would be in a very different scenario if we were looking at an emergency closure of this length," she said. Glen Squires, vice president of the Washington Grain Commission, has not heard of any major disruptions. There are many variables that could cause problems, Squires said, including possible demand for U.S. soft white wheat from Egypt and Yemen. When those countries decide to enter the market and purchase wheat, the lack of river access could provide a hiccup. "Sometimes there's demand out there you weren't planning on," Squires said. "Which is good to have." The amount of grain moving by truck or rail has increased as a result of the closure, Squires said. Carol Bua, spokesperson for Tidewater Barge Lines, said her company prepared for a business reduction during the closure. Tidewater ordinarily employs roughly 200 workers, and laid off about 100 during the closure. The company is preparing for reopening, inspecting equipment and conducting repairs and gearing up for its annual crew training. Bua said the company expects all employees to return. "We really planned for our business and for our customers to get through this closure," she said. "It was not without its challenges, but everybody really pulled together." Ritzville Warehouse Company CEO John Anderson said it's been business as usual for his Ritzville, Wash., grain cooperative. Anderson said exporters were able to plan for the closure. Anderson said January through April is always a busy shipping period during a good crop year. Damon Filan, manager of Tri-Cities Grain in Pasco, Wash., said the 14-week closure has been a logistical challenge. The company got most of its wheat shipped out and in farm storages before the closure, and will begin bringing grain in late March or early April. Tri Cities Grain has so much sold, it will coordinate with exporters which ground piles to pick up first, Filan said. Scott Clemans, U.S. Army Corps of Engineers public affairs specialist for the Portland office, said welding of the four sections of the John Day gate is in progress. The wire ropes that connect counter weights to the gate have been installed and aligned. Most of the new electronics for the control systems are being tested. The new pieces for the Dalles miter gate were barged to the dam the week of Feb. 14. They were to be installed the week of Feb. 21. In addition to the new navigation locks at The Dalles and John Day, Clemans said tainter valves are being installed or maintained. Routine maintenance in other components is also being done as part of the regular maintenance outage. Once the gates are fully installed, the corps will conduct tests to ensure the gates are operating correctly and resolve any issues. "We're not anticipating any trouble whatsoever," Clemans said. 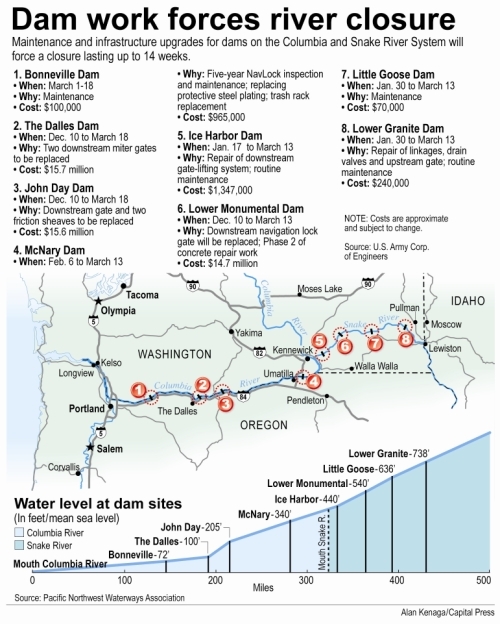 All old gates have been removed at John Day and Lower Monumental Dams, said Kristin Meira, government relations director for the Pacific Northwest Waterways Association. The new pieces are being installed. "It was an amazing thing to see both gate leaves taken off in their entirety at the Dalles," Meira said. "Enormous pieces of steel taken off by these cranes and then laid on the ground to be cut up and taken away for scrap." The new pieces for the Dalles miter gate were barged the week of Feb. 14 to be installed and tested. The gates have to be tested before reopening, both dry and when the locks are filled with water.